The Allen Heritage Guild is an all-volunteer organization dedicated to preserving Allen’s history. The Allen Heritage Guild maintains a museum at 100 East Main St., next to the railroad track. It is open the 2nd & 4th Saturdays of each month from 10:00 a.m. – 2:00 p.m. Permanent exhibits, photo collages and DVD programs relate the history of Allen. Rotating exhibits feature special topics of local interest. The Depot Museum is a repository of historic materials associated with the development of Allen and allows the public to use the printed materials for research while visiting the museum. Annual events such as Sam Bass Day also occur at the Depot. 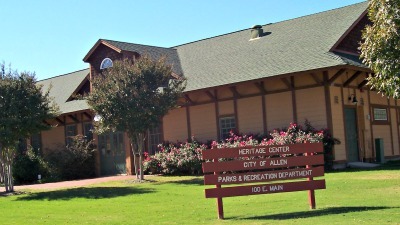 Allen Heritage Village at 450 E. St. Mary Dr. is a site that tells the history of Allen through historic structures in a park like setting. It is a partnership with the Allen Parks and Recreation Department. On site are three houses and two churches which have been restored and furnished with donations by community members. A variety of activities have taken place in the churches and on the grounds. The houses are open the third Sunday of each month from 2-4 pm. Groups interested in docent led tours please contact the Guild website. Guild Meetings are held on the first Wednesday of each month at 6:30 pm at The Train Depot (Allen Heritage Center, 100 East Main Street). Meetings feature discussion on the status of current and proposed projects along with programs given by guest speakers on topics of local historical significance.